In fall 1891, newly appointed Instructor in Psychology Mary Whiton Calkins (1863-1930) set up a psychological laboratory with $200 of equipment in one attic room of College Hall, the main campus building. That same year she introduced a year-long course in what was then called "the new psychology" that is, experimental psychology in contrast with the older speculative, non-empirical psychology known as "mental philosophy". In the first year that it was offered, Calkins's course, which required students to conduct experiments in sensation, space perception, and reaction-times, was elected by 54 seniors. Wellesley's psychological laboratory, one of the earliest in the U.S., was the first to be established in a liberal arts college. Early faculty of note were Calkins (1863-1930) president of APA in 1905, originator of the paired-associate technique, and originator of a system of self-psychology and Edna Heidbreder (1890-1985) president of EPA in 1943, who was best known for her research in concept formation and her classic text in history and systems, Seven Psychologies (1933). 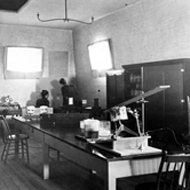 The Psychology Laboratory had grown from one to 14 rooms by the spring of 1914 when College Hall was completely destroyed by fire. For the next 20 years, the Psychology Laboratory was housed in "temporary quarters" until 1935 when the Psychology Department moved into newly constructed Pendleton Hall along with Chemistry and Physics. Between June 1976 and June 1977 the laboratory, library, and faculty and staff of the Psychology Department were phased into quarters in the new Science Center which they continue to occupy today. Psychology offerings were at first included as part of the Philosophy Department curriculum, later Psychology and Philosophy existed as a "double department", and in 1940, they were separated into two independent departments. From its inception, the psychology curriculum emphasized research courses. These were solely devoted to topics in traditional experimental psychology up until the mid-1960s at which time the department began introducing research courses in other areas such as social and personality psychology. Overall, the pattern of change that emerges in the curriculum is from general to more specific course offerings, and in the major, from the time it first appeared in the mid-1920s, from fewer to more requirements. After a period of declining enrollments and majors in the late 1950s, the department rebounded and subsequently experienced an era of unprecedented growth from the mid-1960s through the mid-1970s, during which time the number of faculty doubled from six to 12. Over the past quarter century, the department has continued to enjoy high enrollments and to rank as one of the most popular majors in the college. One notable discontinuity is the termination of the Master's Degree program in Psychology in the mid-1960s, a program that had existed for more than a half century and had awarded about 40 degrees. Continuities include the education of women and the research emphasis in the curriculum. These are underscored by an article that appeared in the American Psychologist in 1985 looking at the undergraduate origins of women who were awarded earned doctorates in the period from 1920-1980. 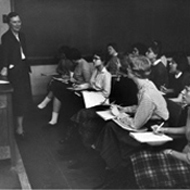 Wellesley, with a total of 150 women students who went on to earn a doctorate in psychology, ranked 15th among all undergraduate programs, ahead of major universities such as Stanford and the University of Illinois, and was the top ranking liberal arts college without a university affiliation.